This great hike travels to Pu'u Ahumoa, meaning chicken hill, a cinder cone on the southwestern flanks of Mauna Kea that erupted some 200,000 years ago. The eroded crater at the summit of Pu'u Ahumoa serves up incredible views of Mauna Kea, Manua Loa, Hualālai, Pu'u Wa'awa'a, and most of the western shore of the Big Island. This hike enters the limited habitat for the critically endangered Palila, a native Hawaiian honeycreeper. The Palila only lives among māmane tree groves on this part of Mauna Kea at an altitude of 6500' to 9000'. Although you'll only be in the lower portion of its habitat, keep an eye out for this yellow-headed bird with a white belly, a grey back, and olive-green wings. This hike is a great place to find solitude on the Big Island. Trailhead: From the western side of the island, take Hwy. 190 south of Waimea or northwest of Kailua and turn onto Hwy. 200 (the Old Saddle Road also known as the Road to Waiki'i). Do not take the new Daniel K. Inoyue highway. From the eastern side of the island, take the Daniel K. Inoyue highway, also Hwy. 200, until you reach the intersection of the old Saddle Road / Road to Waiki'i and the Daniel K. Inoyue highway. Take the old Saddle Road / Road to Waiki'i. On the old Saddle Road / Road to Waiki'i, find the Kilohana Hunter check-in station between mile markers 43 and 44. This is the trailhead for two-wheel drive vehicles. It will help to refer to a map to see the difference between the old Saddle Road / Road to Waiki'i and the new Daniel K. Inoyue highway. It's easy to miss the turn for the old Saddle Road / Road to Waiki'i if you come from the eastern side of the island. Park just off the highway near the hunter's station. 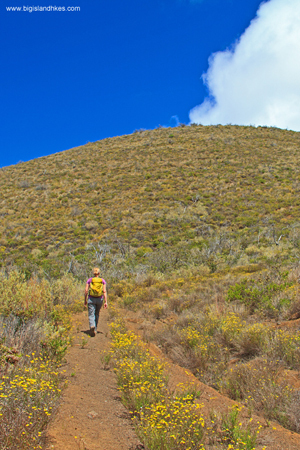 Gear: This hike is at a high altitude on the western flanks of Mauna Kea. Bring warm clothing and rain gear. The trail is pretty rough, so sturdy boots are a good idea. The area is shared with hunters, so wear some bright clothing or commercial orange blaze. Hike: From the Kilohana Hunter check-in station just off of the highway, hike the Pu'u La'au Road, also labeled as Road R-1. Part of the state's Na Ala Hele system, this road travels for some six miles to Pu'u La'au hunter's cabin high on Mauna Kea. As you hike up the road, Pu'u Ahumoa will dominate the skyline to the east. Keep and eye on the old cinder cone as you hike around to its northern side. There are several spur roads off of Road R-1, but don't be tempted to take any of them. You want to follow Road R-1 for 1.75 miles until it climbs around to the northern side of Pu'u Ahumoa. Leave Road R-1 when you find a road labeled R-15. Take Road R-15 for less than a tenth of a mile until you find an intersection. Take the left fork that is much more established and hike toward the northern side of Pu'u Ahumoa. Continue past an area with a slight depression and find another intersection within two tenths of a mile. Take the right fork that travels uphill toward Pu'u Ahumoa. Hike south on a gradual uphill track and if you see another intersection, stay right and continue uphill. The road will eventually become less and less prominent as it takes a 180 degree switchback and begins to climb north on the eastern side of Pu'u Ahumoa. The road eventually turns into an eroded ditch as you trace around the northern end of Pu'u Ahumoa. As you climb toward the summit area where you can begin to peer into the eroded crater at the top of Pu'u Ahumoa, the trail becomes more difficult to follow but is still obvious. As you climb to the western edge of the summit, the trail splits north and south to access the two sides of the crater summit. The eastern summit is a bit higher. The western summit has an old, degraded sign platform that was likely a beacon for low-flying aircraft. It's worth visiting both sides to take in the different views of most of the western side of the Big Island. Enjoy and return the way you came.